Wondering what’s been going on up in the Korea League? Here beloved veteran contributor Thomas Capranica reports on where things stand halfway through the league season. 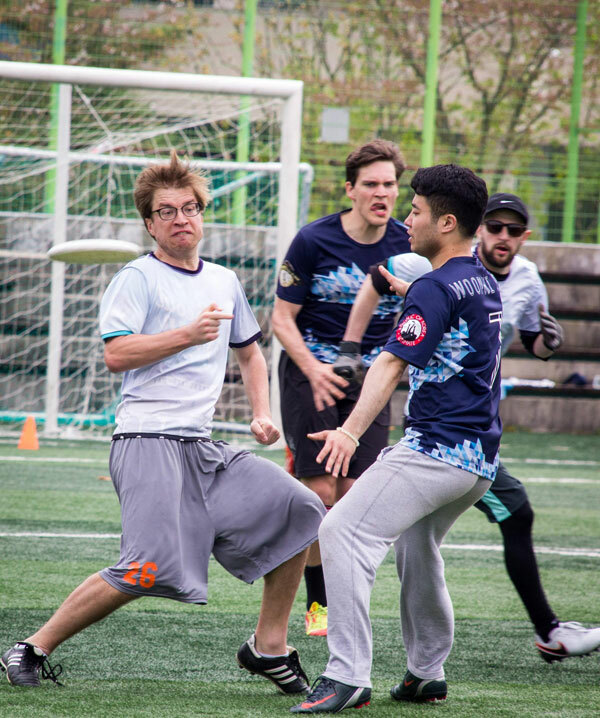 If you want to write for Asian Ultimate Life, and maybe even become a “Veteran Contributor” someday, drop me a note at jared@asianultimate.com. All Asian languages and most subject matters accepted. 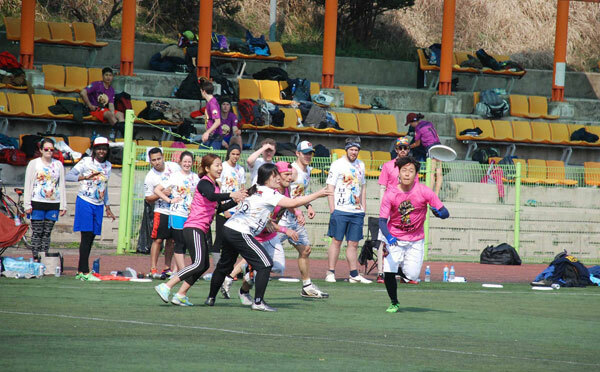 We are at the halfway point of the ROK-U season, two weekends in with teams having played between six and eight games. 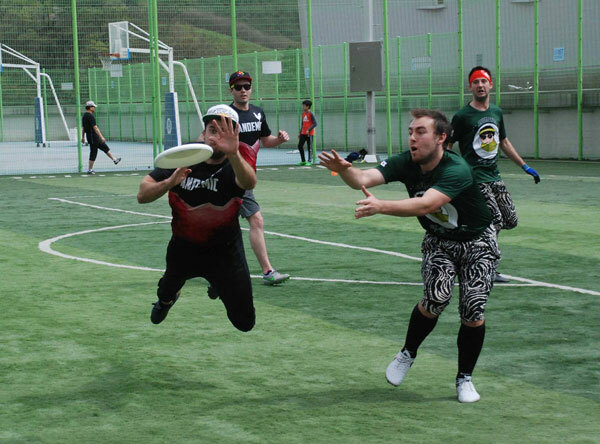 While there’s still a lot of Ultimate to be played, the front runners have begun to separate themselves from the pack. 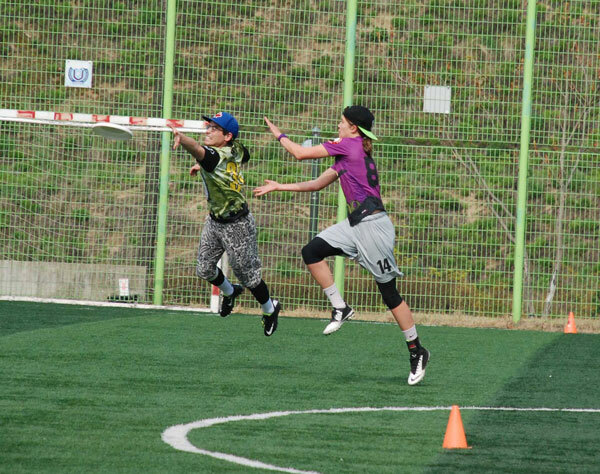 Coming up this weekend are the ROK-U Civil Wars, a weekend of games featuring several intra-regional matchups. Here’s a look at how teams have fared thus far. (ROK-U teams are ranked according to points, Games won are awarded 3 points, losses are 0 points, and a universe point loss is awarded 1 point). All photos by the legendary Ron Genech. Including this one. Somehow. 1. Daegu Hurricane (21 points, 7 Wins, 0 Losses, Goal Differential: +23): The defending champs have picked up right where they left off. Behind Brice Dixon’s skills as a handler and as a coach, they are making the most of a roster laden with rookies. Converted soccer player Toby Andrews is tied for 5th in goals scored with 12, while rookies Karen Werlein and Shannon Fernandez round out their women’s line. Hurricane’s core four players Michael Mcnamara, Georgina Polydore, Gwena Cunha, and Brice are as strong as any in the league, but their ability to capitalize on fresh talent is what will determine how they finish this season. 2. Daegu Lightning (18 points, 6 Wins, 0 Losses, Goal Differential: +23): Another of the league’s original franchises, Daegu Lightning will be arriving in Pohang also with an unblemished record boasting two 1 point victories over top contenders Tsunami and Homey Goats. Curt Metzger and Jessiah Mellott are making the most of the handler chemistry gained playing for the Daegu/Pohang club team BOOM! While Reanna Nelson and Kendrick Payne are improving as continuation cutters to add to their deep game. Practicing nearly every week, Lightning is improving as a team and looks poised for a deep playoff run. 3. Pohang Homey Goats (18 points, 6 Wins, 1 Loss, Goal Differential: +21): Also lighting up the leaderboards is last season’s runner’s up. 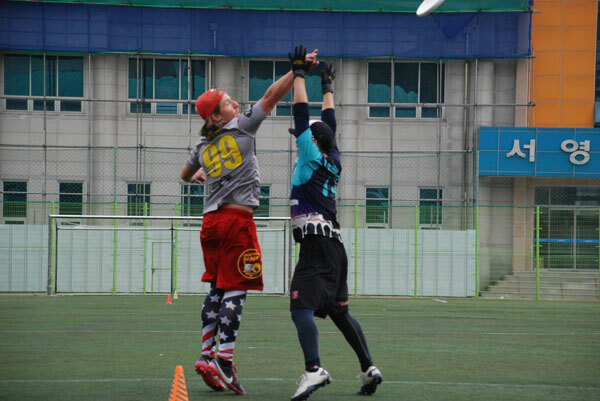 Averaging over six assists per game, Tim Northe is leading the league with 44, and the whispers on the team are that he purposely turned a disc in the final game before his 44th birthday. 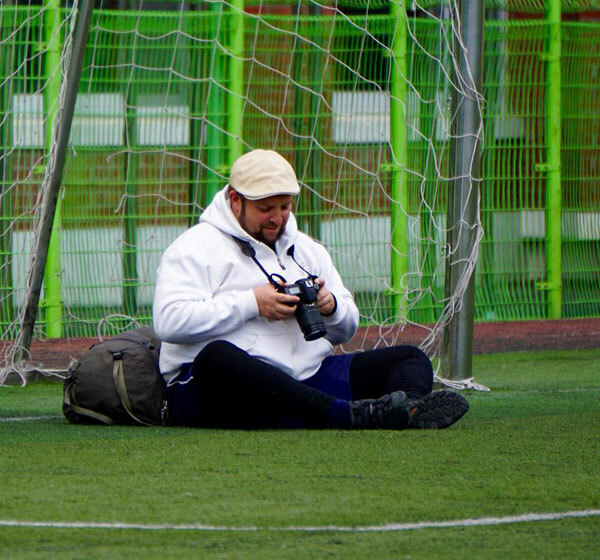 While the Goats look great on paper, their strength remains in the patented Pohang zone. Dave Brudner (a.k.a Café Chomolungma) has evolved his game as the deep-deep of one of the league’s most frustrating defenses. 4. Pohang Overs (16 points, 5 Wins, 1 Loss, Goal Differential: +21): Right behind their cross-town counter parts are the Hangovers. A first for a Pohang team, this group is leaning on its ladies. 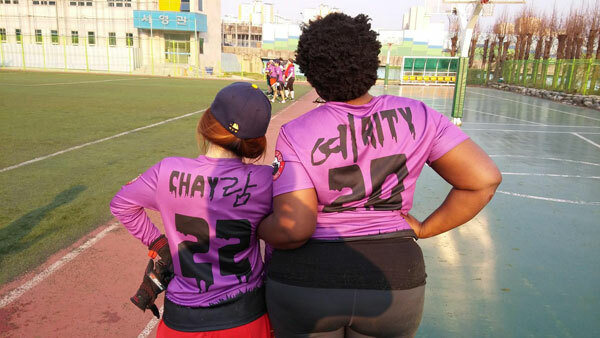 Their two all-stars, Emily Kokotan and Sunhwa Jang, are continuing their evolution as players and have proven their status as fully-equipped Lipizzaner stallions. On their home turf this weekend the Overs have a tough three games. Fortunately, handler Patrick BrO’Malley‘s favorite target, veteran Over Oliver Votteler, is expected to make his return to the lineup. 5. Daegu Tsunami (16 points, 5 Wins, 2 Losses, Goal Differential: +15): The last of the Daegu teams rounds out the top 5. Their two losses this season came against their fellow Daegukins, Lightning and Hurricane, bringing Tsunami’s record against Daegu over the last two seasons to 0-4 by a combined 4 points. Tsunami’s deep roster gets even deeper as they welcome back Michael Kelly, a.k.a. Papa Bear, who’s returning to Korea after donating a kidney to a family member. 6. 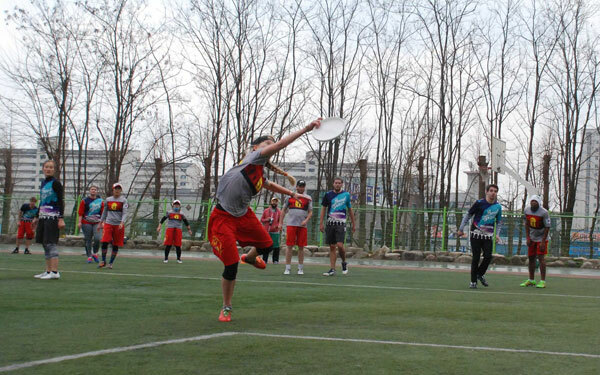 Ulsan Narwhals (15 points, 5 Wins, 1 Loss, Goal Differential: +16): The Narwhals are looking like a contender this season and they have yet to field their full roster. 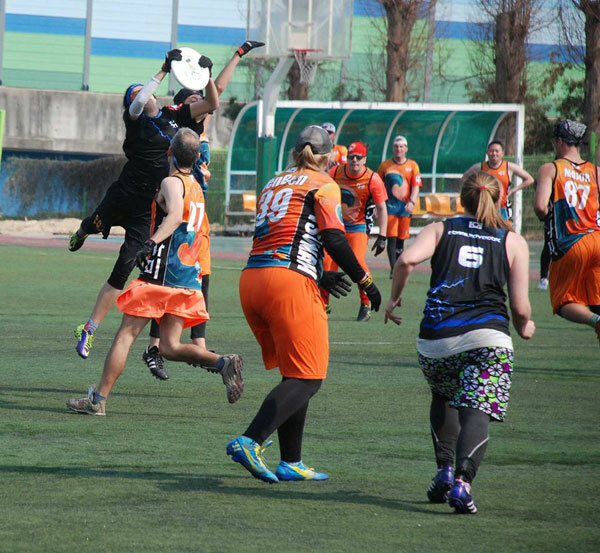 ROK-U rookie handler Alissa Shannon splashed onto the scene on the opening weekend of games heading up one of the leagues strongest and deepest lady lines. 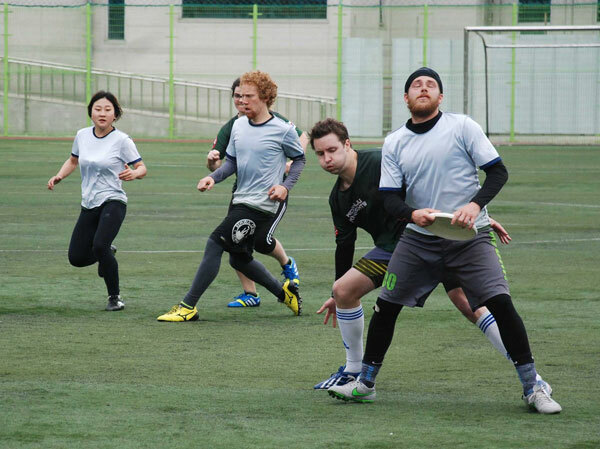 Kevin Schmidt and Doug Arensmen add height and crafty throws to a dangerous roster. In addition to all this, there’s always room for a little (Chris) Debree on the field. 7. Gwangju Uprising (12 points, 4 Wins, 2 Losses, Goal Differential: +2): Scrappy as always, Uprising has clawed their way into the top half of this list. How do they do it? First of all, practice. Gwangju is making a huge push to expand the ultimate scene in southwestern Korea, practicing most weeknights at their local university. Secondly, beer. Beer, beer, beer. Want players to want to show up to practice? Give them beer. Assistant captain Hyeok Kim has made the most of a team sponsorship by Hite Beer. 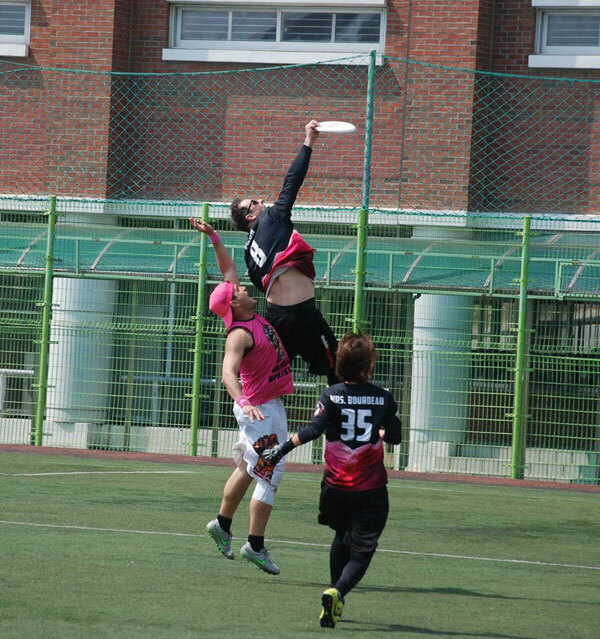 Lastly, if you have never been witness to a halftime speech by captain David (Carne) Miller, it’s this writer’s suggestion that you find yourself near Uprising’s sideline in Pohang this weekend (you won’t have a hard time finding their bright pink jerseys). 8. Seoul Hammers (9 points, 3 Wins, 5 Losses, Goal Differential: 0): Another team that has been without its full squad, much to the delight of the rest of the league. 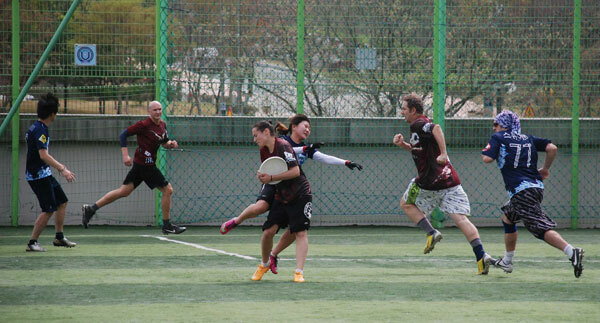 The Hammers’ top seven might be the most formidable in the league filled with ROK-U veterans and ringer rookies. Assistant captain Gina DiBenedetto has put the team on her back in the absence of head captain Jinho Hwang, whose return should spell a boost in the number of throws of the team’s namesake. 9. 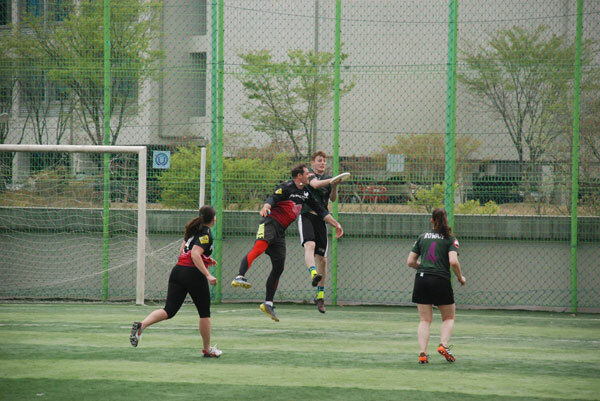 Busan Apocalypse (9 points, 3 Wins, 4 Losses, Goal Differential: -10): After starting 2-1, Apoc dropped three of the next four, playing without one of their top males, James Messler. There’s certainly room to grow for Apoc and no team has better leadership to make that happen. ROK-U veterans Madeline “Mad Dog” Stephenson and Hilary “Lil Bit” Dumas are as experienced as we have got in this league, look for them to make the most of an exciting line of young and hungry cutters. 10. Daejeon Pandemic (9 points, 3 Wins, 4 Losses, Goal Differential: -15): After winning three of four at the Ulsan Double, Pandemic is back on track. The universe point win over Pohang Overs sets the tone for a late season surge for a team that looked like contenders last season. At the very least, big man Jordan “Yukon” Donotti is once again in contention for photo of the year. 11. 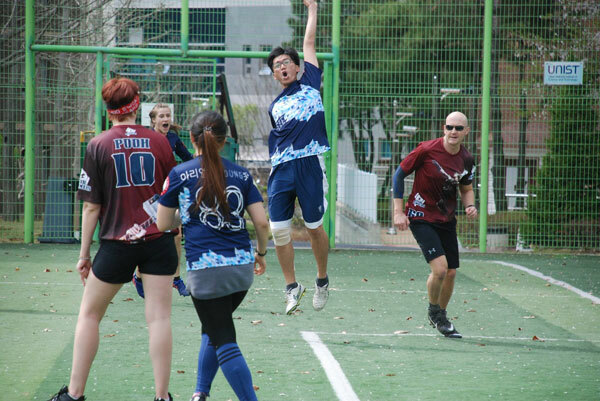 Hongseong Ajumafia (8 points, 2 Wins, 5 Losses, Goal Differential: -2): The Ajumas have had a tough road so far, having gone up against several of the highest ranked teams on this list, with 1 point losses to Tsunami, Hurricane, and Pandemic. The emergence of rookie Jackson Elliot as a playmaker for the handlers has been a huge boost to this roster. With the talent on this team, no one is sleeping on Ajumafia’s chances for a late season push. 12. Busan Evolution (8 points, 2 Wins, 5 Losses, Goal Differential: -6): No matter what happens for Evolution this spring, when it’s all said and done they will have something that no one can take from them, ROK-U’s first ever PICNIC TIMEOUT! 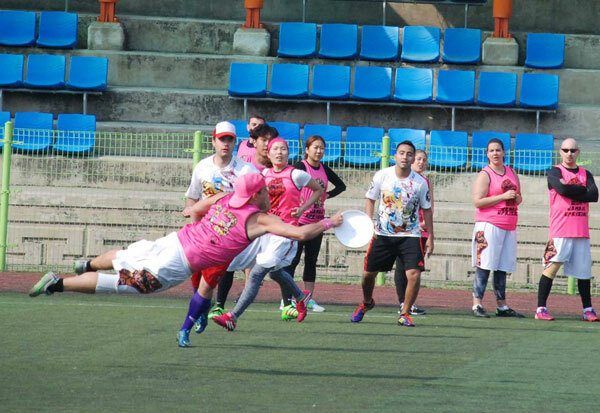 This team is proving that they’re as fun as their pokemon-themed jerseys. On the field, ‘Evo’ has taken strides since their first game. In Ulsan, they had a late lead against #1 ranked Hurricane but were unable to hang on for the victory. 14. Wonju Knights (0 Points, 0 Wins, 7 Losses, Goal Differential: -34): It’s not surprising to see the league’s expansion teams at the tail end of the rankings. The key for the Knights this season will be to focus on developing as a team. Captains Kristen Bishop and Jodi Odgers are fit for the job of keeping spirits up and motivating a roster that has potential for the fall. 14. Daejeon Freeze (0 points, 0 Wins, 7 Losses, Goal Differential: -37): Filling out the list is the Daejeon Freeze. Captain Gannett Cassidy’s team simply has not had the on-field success she was hoping for. Not helping matters has been the loss of promising rookie Caroline Gonzales. Change could be on the horizon for Freeze with the return of ringer-handler Kathy “Kashy” Lee. • May 7th and 8th games will be played in Seoul and Pohang. • Team and Individual Statistics can be tracked here. • To get more updates on ROK-U be sure to “like” the Republic of Korea Ultimate page on Facebook. Also, follow the Asian Ultimate Life Facebook page and our twitter feed @asianultyblog.